The AKG Perception 420 large diaphragm condenser microphone gives you high sensitivity, a very forgiving SPL capacity, and multiple pickup patterns; in short, it's a versatile addition to any pro facility, where uncompromising quality is standard. The Perception 420 features a 20dB pad, switchable bass roll-off, and pristine sound quality. You can select between cardioid, omni, and figure-eight pickup patterns for a variety of miking applications. This mic is ruggedly constructed and includes a spider-style shockmount and aluminum carrying case. AKG means quality, and the Perception 420 is no exception! The AKG Perception Series includes the 120, 170, 220, and 420. Each model features a 20dB attenuation pad for an even wider range of miking capabilities including vocals, brass instruments, electric guitar amps and drums across multiple market applications of studio recording, live sound and broadcast. Designed and engineered in Vienna, Austria, the entire Perception line offers AKG's signature sound quality captured in a rugged precision-tooled zinc/aluminum alloy body with a dent-resistant stainless steel grille screen. 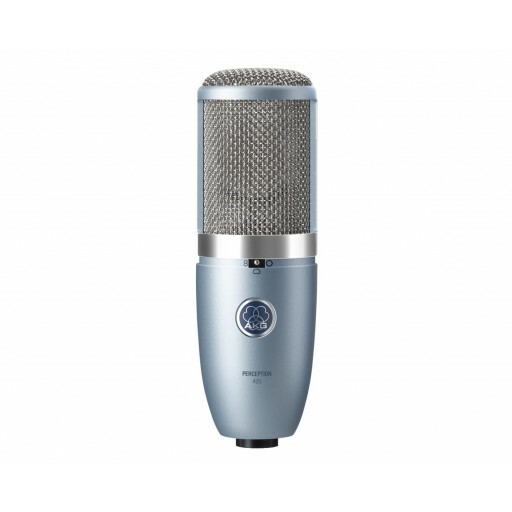 AKG's Perception 420 is a multi-pattern large-diaphragm condenser microphone for more demanding professional studio recording applications. Three selectable polar patterns - cardioid, omnidirectional or figure-eight - allow a wide range of stereo miking techniques and ambient recording. The 420 is ideal for professional studio recording of grand piano, woodwind and brass instruments as well as drums and percussion. Offering high sensitivity and 155dB maximum SPL, the Perception 420 delivers a warm transparent sound quality in a selection of cardioid, omni-directional or figure-eight pickup patterns. A switchable bass cut filter and preattenuation pad enable the Perception 420 to be used close to sound sources in sound fields as high as 155 dB. The microphone's chassis is made of precision-tooled zinc/aluminium alloy and boasts a dent resistant stainless-steel wire-mesh front grille. It comes complete with a spider-type shock mount in an aluminium carrying case. AKG has been designing and building top-quality microphones for over 60 years, and they continue to put great effort into meeting the needs of modern engineers, producers, and artists. From new, budget-minded models to classic studio essentials, AKG puts quality into every microphone they produce. When you see the familiar logo on an AKG mic, you know it's made to do the job, and do it well.